The Yoast SEO plugin is an easy way to update all of our SEO Tags and to see how well our page tags and content are structured for SEO purposes. This plugin will appear at the bottom of all pages and posts. For our example, we will use a very basic post we have already created. When you create a new page, the SEO plugin by Yoast automatically populates information based on your page title and page content. The remaining fields are left blank. The Yoast plugin allows us to update our SEO Title (title tag) and Meta Description. This information can be checked against a targeted Focus Keyword to see how well the tags and page content are structured for SEO. As we update the SEO tags throughout the Yoast SEO plugin, we can see the changes we make in our Snippet Preview. The Snippet Preview will show you how your page and tags should appear in a Google Search result. Google can display some results differently but this preview should be accurate in most cases. Selecting a Focus Keyword allows us to get an idea of how well our page might do in search engines by checking for the keyword in important places. The focus keyword should be relevant to your page topic and content. 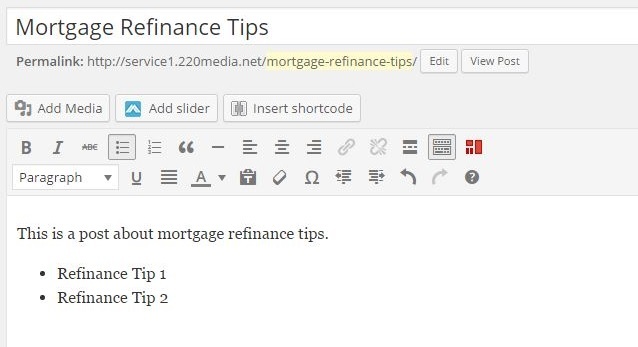 Our example page is about Mortgage Refinance Tips so our focus keyword should be similar. You can select a single keyword or multiple keywords. 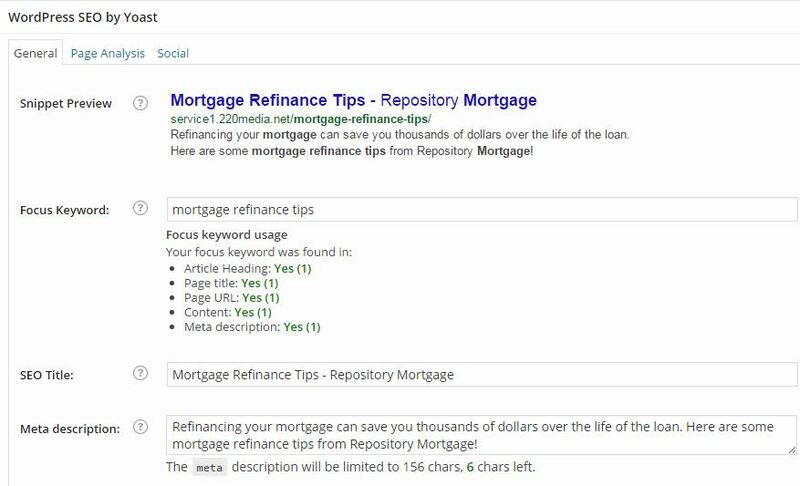 If you start typing Mortgage Refinance Tips, the Focus Keyword field will generate suggestions, just like if you were searching in Google. We will stick with mortgage refinance tips for our example. After you select your Focus Keyword, you may have noticed that your Snippet Preview changed. We also have a new Focus keyword usage section that indicates if our focus keyword is appearing in important areas. You will also notice that your focus keyword is made bold in the Snippet Preview. The SEO Title section updates the title tag on our page. Google limits the length of a title tag to 512 pixels wide. Most of the time, this will fall in the range of 50-60 characters. Your title tag should be relevant to the content and topic of the page. Ideally you will include your Focus Keyword. This first title tag is a bit too long. The Yoast SEO plugin lets us know by displaying a warning message below the SEO Title. You may also notice that the end of our Snippet Preview is cut off and we see "...". We've shortened our tag to the correct size and now we no longer receive the warning and we can see the full SEO Title in our Snippet Preview. The Meta Description field allows us to give a more detailed description of our page and it's contents. A meta description is similar to our title tag in that it should be relevant to the content and topic of the page, however the Meta Description should encourage a user to click your link and visit the page. The Meta Description is limited to 156 characters so we have a bit more room to achieve this. Here is an article from Yoast on creating Meta Descriptions. The Yoast SEO plugin will give us a warning if we exceed this limit and just like our title tag, our Snippet Preview will not display entirely and we will see "..." at the end of the description. We've shortened our Meta Description to an acceptable length below. If we've done everything correctly, we should see no errors, all of our information should fit into our Snippet Preview, and our Focus Keyword will appear in all of the correct places. We can now view the Page Analysis to see how well our SEO information ties into the page as a whole. The Page Analysis tab allows us to see how our page might do in search engines by looking at the content and SEO information we've added into our Yoast Plugin so far. You'll notice we didn't do so well in a few categories. We only included one sentence and a few bullet points in our example page to show how this tab functions. We received a red bullet point because of the length of our body copy. This highlights the importance of having quality content on your site. There are a few other failed categories as well which you can see below. Improving the quality of our content will improve our analysis results. The Social tab allows us to create unique titles, descriptions, and use unique images for our page on different social media sites. By default the tags you have created in the General tab will be used on the sites. We are happy with our current tags so we are not going to update these.